Custom noise makers make great promotional giveaways for sports events and community events, which will spread team spirit and your brand name all over town! ProImprint has a wide range of promotional noise makers that will make your brand scream! Shop today and avail some of the best offers and deals that cannot be matched by many others. We offer the lowest price match guarantee, discounts on bulk purchases, rush orders, quick shipping and much more! FREE set up and artwork assistance on every order! 100% customer satisfaction guaranteed! 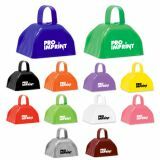 Custom noise makers from ProImprint are cost effective promotional giveaways to support your sports leagues or schools and to market your brand at once! While the high decibel sounds will make the audience lend an ear to these personalized noise makers, your logo also gets a proud display. 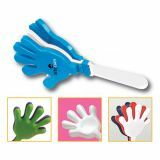 An extremely popular and versatile giveaway, custom logo noise makers are well suited for all your special occasions including sports leagues, corporate weekends and holiday parties. 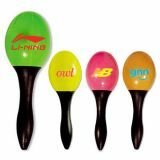 Your customers will love to root for your team with these imprinted whistles that will surely prompt them to perform better and to come out winners. Make some noise as you promote your brand with these personalized noise makers, which will surely turn a few heads! 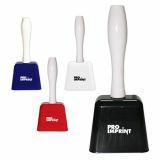 ProImprint has a range of promotional noise makers including logo megaphones, maracas, custom whistles and more. Offered in bright colors, these will tempt them to scream their lungs and to turn the world around. Ideal for sporting events, pep rallies, tradeshows and the like, these delightful logo imprinted noise makers will make your customers the die-hard fans of your brand in no time! Custom noise makers like megaphones not only make delightful promotional giveaways but also excellent wedding favors and gifts for birthdays, milestone celebrations, bachelor parties and the like. Just imagine the fun it generates when your team calls out their names or shout at the camp grounds, which will ring a bell of your brand instantly! Sports fans will find our logo megaphones handy for cheering. The best part is that apart from turning on the teams, the brand name imprinted on these custom noise makers will ensure loads of exposure for your brand. If you are planning to throw a corporate party at the weekend, just pick up some personalized maracas from ProImprint make a noise of noise, that too without your team having to strain their vocal cords.Just see the fun factor hitting a high and everyone waltzing to the fast Conga beats when these custom maracas come out in the open! You can shop from our impressive lineup of custom printed noise makers to make your brand promo super fun. The noise and the din will surely attract loads of attention from around, which in turn will make your brand well noticed. Pick up your choicest noise makers from ProImprint and should you need any selection tips or assistance, we are never far away. Call us at 844-776-4677 or email us at info@proimprint.com and we can help you find the best options.